Our PDF Thumbnails plugin automatically generates fixed image versions of all PDF files in your Media Library, to use on your site as you wish. 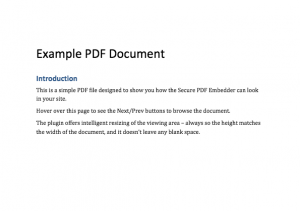 *Note: the PDF Thumbnails plugin creates a single image of the first page of your PDF document. You can use them as featured images in posts containing an embedded version of the PDF, or as a visual clickable link to download the PDF directly. It also displays the thumbnail as the 'icon' for the PDF in the Media Library, making it easy for authors to locate the PDFs they need to insert in a post. PDF Thumbnails is the perfect companion to any of our PDF Embedder plugins, or can be used standalone! You can purchase by Credit Card or PayPal to download the plugin straight away. Money-back guarantee: If you are not satisfied with our plugin, within 14 days of purchase we will happily refund the full amount if you do not wish to continue using it! Our license allows you to use the product indefinitely, and also includes support and updates for 12 months. See details.